We’d love your help. Let us know what’s wrong with this preview of The Postpartum Husband by Karen Kleiman. To ask other readers questions about The Postpartum Husband, please sign up. Felt overly simplistic and condescending without describing or explaining evidence to back up the recommendations. Streamlined, which makes sense, given the topic and audience. And while I wasn't the audience, it was a nice read, in case I ever was in a place to recommend a book to a puzzled couple or partner. I had forgotten I'd ordered it as a part of the postpartum doula required reading and had my husband read it after I had my daughter this winter. My husband found it less helpful--he thought the majority of the advice was incredibly obvious and while I went through a dark spell after the birth of our da Streamlined, which makes sense, given the topic and audience. And while I wasn't the audience, it was a nice read, in case I ever was in a place to recommend a book to a puzzled couple or partner. I read this to see if I should recommend it to my husband, but found it to be full of concepts and strategies that my husband was already doing. Would be a great book for some husbands, just not mine. Just gave myself a refresher on this wonderful resource for husbands. I love the way this book is divided into brief, 1-2 page chapters with bullet points, which makes for such easy reading and accessibility. Some may describe this as a bit simplified for partners but I liked the format (bullet points) and the straightforward data and easy recommendations. It can be a good reminder for husbands who want to support their wives as they work through their postpartum symptoms. AWESOME resource for dads, partners, etc. who are in a relationship with someone struggling during or after pregnancy. Men typically want to "fix" their partner's depression or anxiety, and they can't. But there are things they can do to help support their partner and take care of themselves. 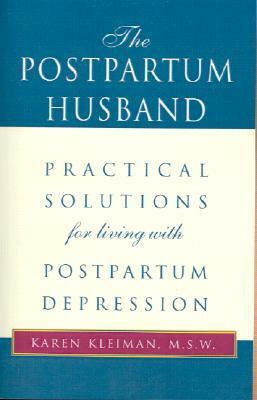 Karen Kleiman is well known as an international expert on postpartum depression. Her work has been featured on the Internet and within the mental health community for decades. In 1988, Karen founded The Postpartum Stress Center, LLC, a treatment and training facility for prenatal and postpartum depression/anxiety disorders where she treats individuals and couples experiencing perinatal mood & Karen Kleiman is well known as an international expert on postpartum depression. Her work has been featured on the Internet and within the mental health community for decades. In 1988, Karen founded The Postpartum Stress Center, LLC, a treatment and training facility for prenatal and postpartum depression/anxiety disorders where she treats individuals and couples experiencing perinatal mood & anxiety disorders.